We spend so much time in our kitchens that it’s only natural to want our most frequented gathering space to reflect our tastes and personalities. 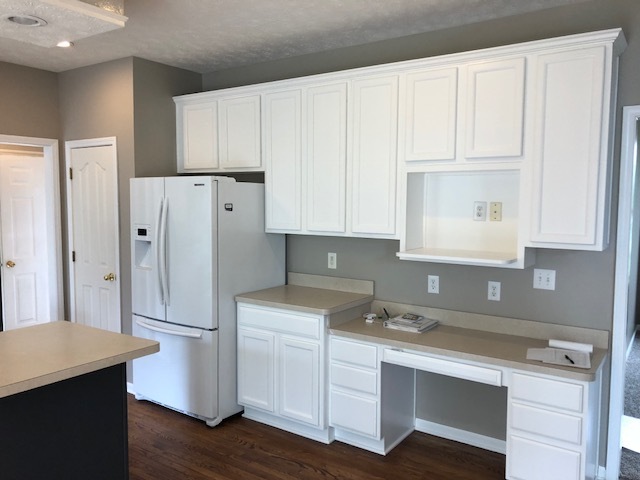 While painting the walls is one easy way to refresh your kitchen, painting kitchen cabinets is another simple, cost-effective option for transforming the look and feel of your kitchen quickly. But what is the best color to paint kitchen cabinets? While you can choose to paint cabinets any color you’d like, the following kitchen cabinet color ideas are some of the most popular choices amongst homeowners. White remains one of the top kitchen cabinet paint colors for many reasons. Not only do white kitchen cabinets make your space look clean and inviting, they can brighten up any kitchen — even if the room has little to no natural light. White kitchen cabinets are timeless and can be painted in a variety of shades to suit your taste and complement other fixtures. Your kitchen is small or dark. You want the room’s other design elements to be the focal point. You can’t decide on a cabinet color — white cabinets are always a good option! If you want your kitchen to be trendy yet timeless, painting your kitchen cabinets black can be an ideal solution. While you may not think that black cabinets scream “traditional,” adding other paint hues and warm tones on the walls, countertops or other wood accents can create a sleek, polished look that stands the test of time. Black cabinets play up the contrast with white walls and backsplash, plus look amazing in kitchens of every type and size. Tip: Don’t Forget the Kitchen Island! If you have a kitchen island, painting it in a dramatic, black hue can give your kitchen a more sophisticated style when paired with white cabinets. The rest of your kitchen decor is lighter in color. Your kitchen receives an abundance of natural light. You have white subway tile backsplash — black cabinets complement this style extremely well! If you’re looking for a versatile cabinet color that adds a sense of warmth, you can’t go wrong with a mix of gray and beige, or greige. 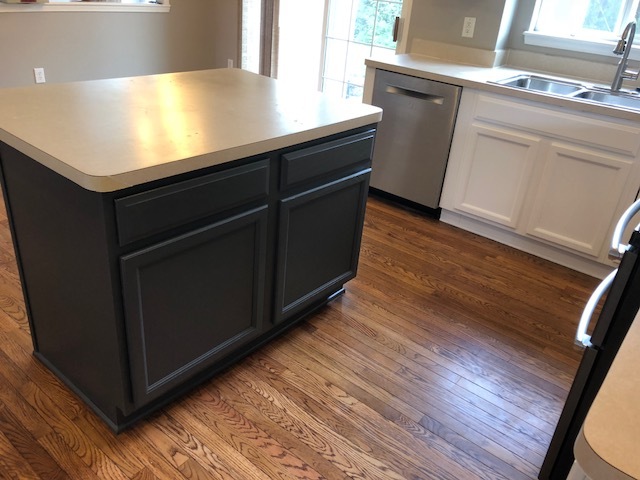 Greige is a neutral paint color that looks great in most kitchens, so it’s a top choice amongst homeowners who are looking to repaint their kitchen cabinets. You want to add a hint of warm color to the room. You want a charming, relaxed, or soothing look. If you’re looking for a classic yet modern shade for your kitchen cabinets, gray paint can be a great choice. Gray is a versatile color that flawlessly complements traditional, contemporary, modern, or Old World kitchen styles. It comes in both warm and cool tones, so it’s easy to pair gray with a variety of backsplash designs, appliances, and countertops. Your kitchen is on the smaller side or has little light. In this case, use an understated or lighter gray to open up your space. You want to add depth and contrast to your kitchen. In this case, use more saturated gray in a darker shade. You want your natural wood grain to show through. Painting wood kitchen cabinets a soft gray can let the wood grain peek through for a more rustic, natural look. If you want to completely energize your kitchen, bright and bold paint colors like darker blues, golden yellows, and even vibrant greens can work well on kitchen cabinets. Just be conscious of how the bright paint color will coordinate with your wall paint and kitchen fixtures. You don’t want your space to look too busy! You have light or neutral wall colors. You want your kitchen to make a big statement. You want to add more interest or depth to your kitchen fixtures. If you want to create a subtle pop of color in your kitchen, consider using a pastel-colored paint on your cabinets. Pastel blues, greens, and yellows can still make a statement without making your kitchen appear too dark. Soft pastels on kitchen cabinets give off a charming, sweet aesthetic in any style of kitchen; whether your space has a country, modern, or contemporary feel. You want to brighten up your kitchen but typically shy away from bold hues. The walls and countertops are painted white or neutral. You want a breezy, relaxing ambiance in your kitchen. Another popular look is two-toned or dual-tone kitchen cabinets as this design method can make a stunning, visual impact in any kitchen. The two-toned look is achieved by painting upper cabinets a different color than lower cabinets. You can also get this look by painting your kitchen island a contrasting color that complements your wall cabinets. There are a variety of color combinations that work well together, so any style of kitchen can benefit from this cabinet painting technique. You want a unique, contrasted look in your kitchen. You want to paint your bottom cabinets black and your top cabinets white. You want to add a bold color to your bottom cabinets and keep your top cabinets neutral in color. You have extra time for painters to be inside your home. 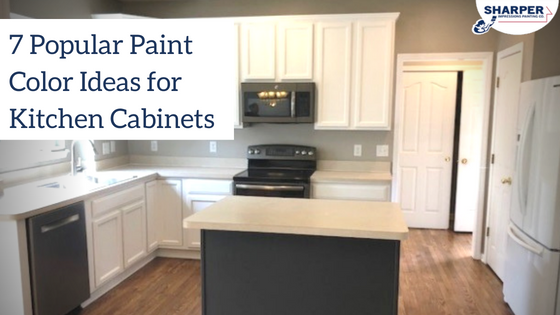 Two-tone cabinet painting takes more time than using just one color of paint. While painting kitchen cabinets may look like a simple task, you should trust your painting project to experienced interior trim painters. A professional painting company will know exactly how to prep your kitchen cabinets to achieve the perfect paint application, and which paints and finishes will look the best and last. If you’re ready to refresh your kitchen cabinets with new paint, request a free interior painting quote today!